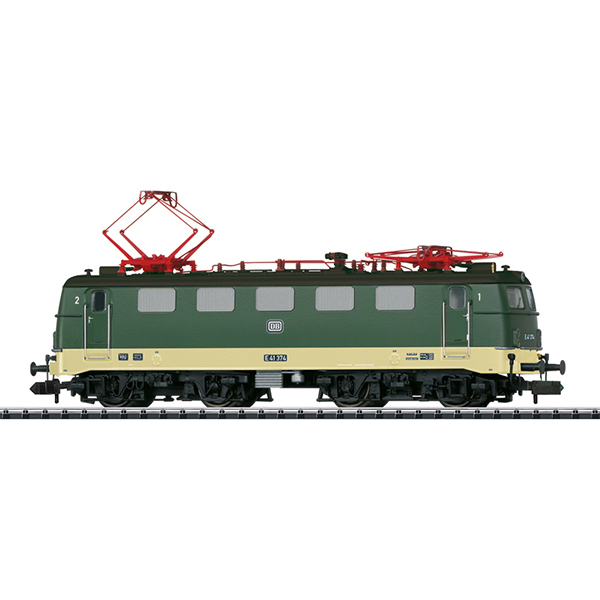 Prototype: German Federal Railroad (DB) class E 41 standard design electric locomotive. Chrome oxide green basic paint scheme with special paint scheme for the frame in green/beige. Version with double lamps, multiple forced air vents with vertical fins, and continuous rain gutter. Road number E 41 374. The locomotive looks as it did around 1966. Use: Light freight and passenger trains in commuter and long distance service. Model: The locomotive is new tooling. The body and frame are constructed of die-cast metal. The locomotive has a built-in digital decoder and a sound generator for operation with DCC and Selectrix. The motor has a flywheel. 4 axles powered. Traction tires. The headlights and marker lights change over with the direction of travel. Warm white LEDs are used for this lighting and there is cab lighting. All of the lighting can be controlled digitally. The locomotive has NEM coupler pockets. It also has separately applied grab irons. Length over the buffers 98 mm / 3-7/8". One-time series for Trix Club members. The year 1956 was memorable: Triple headlights were introduced on branch lines, there were now only two passenger car classes, and on September 29, the DB took delivery of the first electric locomotive from the new type program – an E 41. Indeed, in Germany steam motive power still accounted for 87 percent of all gross ton kilometers, but for the first time DB bought more electric locomotives than steam locomotives. "Motive power for the structural transformation" was the message. The smallest new construction electric locomotive with a length of 15.66 meters / 610-3/4" over the buffers, 2,400 kilowatts / 3,217 horsepower hourly output, and a service weight of 67 metric tons fit this image ideally. "Light train service on main and branch lines", was the notation in the type program as the planned application – as a universal type for express, passenger, and freight trains the 451 units purchased between 1956 and 1969 worked as the successor to the E 44 in commuter service between the Alps and the North Sea. "Many club members know the E 41 from their youth, for it was used in commuter service and limited stop passenger service, later for express and Citybahn trains", explains Minitrix product manager Claus Ballsieper, who also saw this standard design locomotive pulling freight trains. Road number E 41 374 on the roster in 1966 was selected as the prototype for the exclusive Minitrix Club model for 2018 for more than just the familiarity of the class. "Minitrix is hereby realizing the E 41 for the first time – and indeed industrywide for the first time with headlight / marker light changeover", says the product manager emphasizing the exclusivity of the club model that moreover was placed into service in a unique paint scheme. The unit was delivered in 1965 to the Frankfurt (M)-Griesheim District with an experimental greenish beige painted frame, which also made the model in Era III a one of a kind. Other characteristics of road number E 41 374 within its class were the ends with double lamps and headlights as well as vertical grab irons with a step grating, a continuous rain gutter on the edge of the roof, type DBS 54 pantographs, and five double forced air vents with vertical fins on each side of the of the body. The German Federal Railroad laid great value on extensive standardization of electrical and mechanical parts for the modernization of its motive power with electric locomotives. The reason for this was to minimize spare parts inventories and to save costs. Siemens/Krauss Maffei developed the classes E 10 and E 40, and AEG/Krupp the class E 50 heavy freight locomotive. Henschel and Brown, Boveri & Cie designed the class E 41 with the DB. The E 41 had an axle load of 16.8 metric tons and was up to any task on electrified lines. The E 41 shared with its sibling classes the clean lines of the locomotive body welded to the bridge frame with its hollow girders as well as standardized components such as drive mechanism or axle bearings. However, there were also many departures from the other new construction locomotive designs. The E 41 thus did not have a high-voltage control installed, but rather a simple low-voltage control. The relay system had physical and acoustic effects for passengers: When the locomotive was accelerating a pushed shuttle train, the coarse switching steps in the relays caused rough pushing from the locomotive and a magnetic field in the current divider led to a loud bang when the relays were switching. Yet, these surrounding circumstances had if anything folklore characteristics and affected in no way the use of the ubiquitous units of this class with their speed of 120 kilometers per hour / 75 miles per hour. "The four-axle E41 has become legendary from its characteristic startup sound that gave the units nicknames such as 'Firecracker'", says the Minitrix product manager, addressing the special acoustic feature that he has included in the extensive sound repertoire of this digital model. In addition, operating sounds such as running sounds, squealing brakes, and vents as well as railroad technical sounds such as station announcements, multiple whistles, bell sound, or conductor calls. "A total of 28 digital functions can be controlled in DCC – including light functions such as headlights and cab lighting." The first units of the class E 41 were based at the maintenance facilities for the Karlsruhe and Munich Districts. In succeeding years, the authors Roland Hertwig / Werner Streil ("The Class E 41") have verified that the class E 41 / 141 locomotives were in 15 districts from Hamburg to Munich and from Essen to Kassel. From the Mid-Sixties on, the area of use spread to shuttle train operation in commuter service. Road number E 41 374 was based on June 9, 1965 at Frankfurt (M)-Griesheim, from where 32 class E 41 locomotives ran "primarily on the route Frankfurt (M)–Giessen–Hagen" (Hertwig/Streil). On April 30, 2001, the DB retired road number 141 374-9 at the maintenance facility at Nürnberg West. In 2006, the class 141 was finally removed from the active roster. "The popular E 41 locomotives have not however disappeared”, says Claus Ballsieper, referring to the many museums, where these famous standard design locomotives are preserved. "If you want to see a prototype of the club model, you will quickly find a lot of material at our club cooperation partners – but there is only one locomotive with the ochre colored frame: as a Minitrix Club model.